Would you like to save some of that summer bounty for use over the winter? 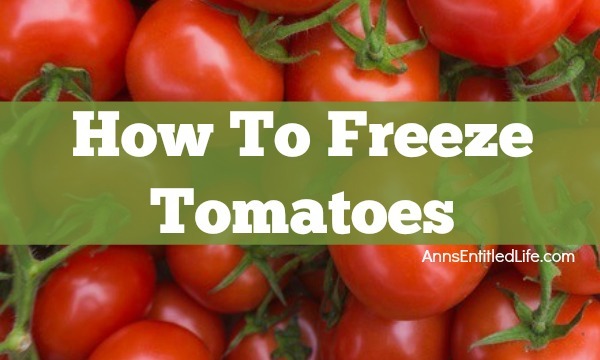 Learn how to freeze tomatoes for a change of pace from canned tomatoes. 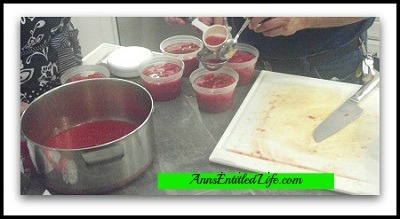 The process was pretty much the same, and fairly easy! That was the giant pile of tomatoes we had to work with. 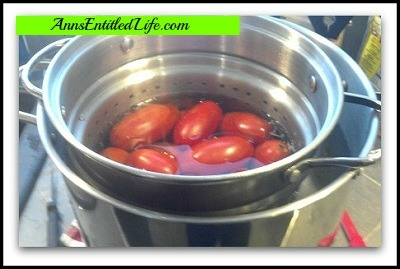 I started off by washing the tomatoes as the Roma were quite dirty. A pasta pot with the strainer inserted was filled half way with water and brought to a rolling boil. 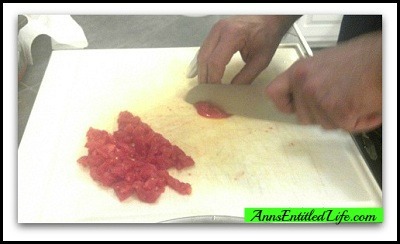 Tomatoes were inserted for 2 minutes and 30 seconds (2-3 minutes depending on the tomato type should do it). You want the skins to be easy to pull off, but not have cooked tomatoes. A larger container was filled approximately a third of the way full with ice and cold water. 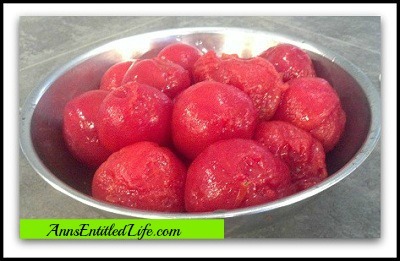 The scalded tomatoes were plunged into the ice water when removed from the stove to stop any cooking. I choose not to core prior to scalding. I worry about excess water entering the fruit. I also choose not to make an X at the bottom of the tomato before immersing in the boiling water. I think it is just an extra step myself, although many people do it. 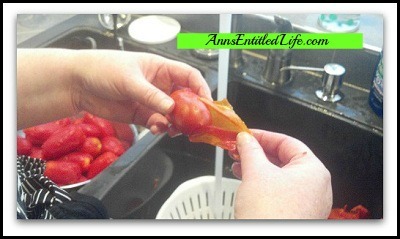 Once cored, the skins peel away quickly and easily! Looks like those skins and cores did add to the bulk! 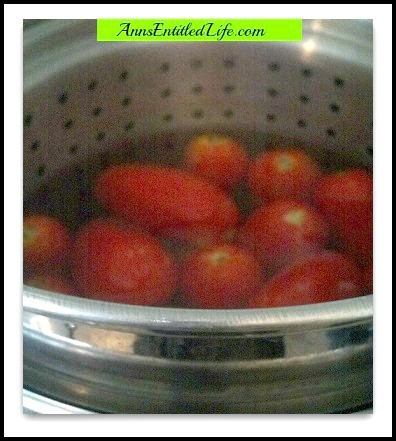 After the tomatoes were peeled, we let the tomatoes sit a few hours in the refrigerator so the excess water would drain. 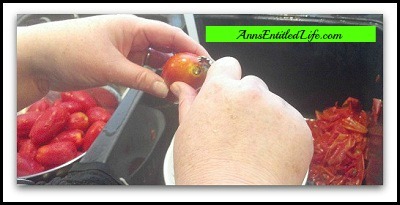 We then squeezed the tomatoes into a bowl, removing juice and seeds. This was saved for later. 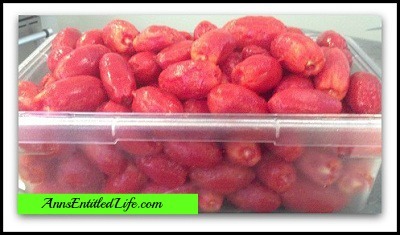 The tomatoes were diced, and placed into containers. The excess tomato juice was strained. 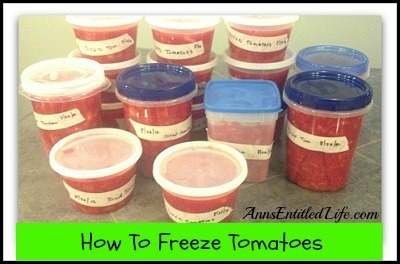 The clear juice was poured to “top off” the tomatoes in an effort to prevent freezer burn. 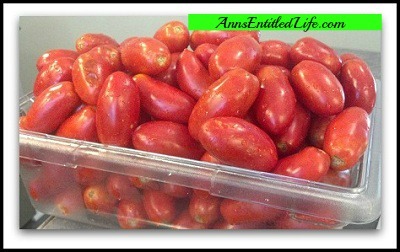 The small containers contain 15-16oz, the large containers, 28-29oz of no salt, diced tomatoes. While easy to do, this is a time consuming process. 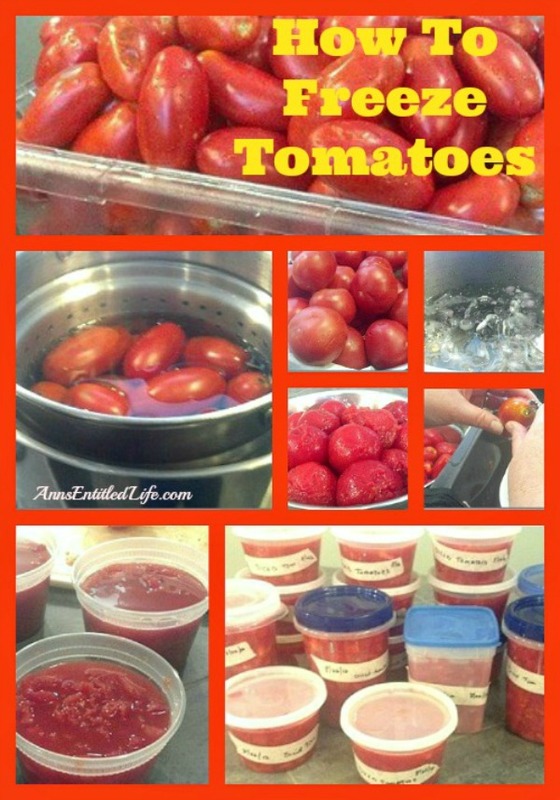 I swear I was on my feet for almost six hours processing all those tomatoes and cleaning up afterward (and in-between as I am a clean-as-you-go type cook and baker). 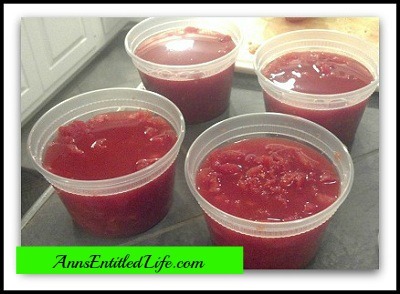 I pulled out tomatoes to dehydrate, but still ended up with 19 pounds of unsalted, diced tomatoes to use in soups, stews and sauces this winter. Update: I first did this a good 7-8 years ago. Since then, I have harvested whatever tomatoes have grown in the backyard, and what we have purchased at a roadside stand. And the process has gotten a whole lot easier. 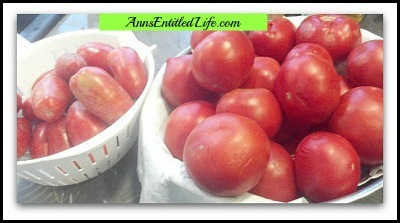 If I start with under 10 pounds of tomatoes, I can get them processed in under an hour usually. YMMV of course!